The eldest son of the venerable Sir Morgan ap John cannot have owned Tredegar for very long and very few references to him survive. This can be rather frustrating when compiling a history, but, perhaps, readers of this blog may be able to add any information that has eluded me. Piece by piece we should be able to put together the Morgan jigsaw. John married Lettice, the daughter of Sir George Herbert of St Julians in Newport. Sir George, the third son of William, 1st Earl of Pembroke, established a power base at St Julians that threatened the local dominance of the Morgans of Tredegar. Understandably, the local gentry in those times got quite miffed when their jealously guarded local interests came under threat and often responded quite ruthlessly. Many of them had gangs of armed retainers in their employ and were not afraid to use them. The head of a powerful family resembled a 'gangland boss' far more than the Victorian ideal of the 'respectable paternal aristocrat'. The marriage of John and Lettice did little, it would seem, to dampen the rivalry between the two families. The Morgans and the Herberts would soon clash. John died in 1513. His eldest son William succeeded, and, fortunately for us, the surviving material documenting his life is far richer. 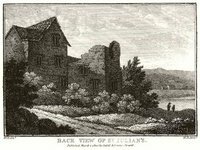 The image above is the 'Back View of St Julian's House' which appeared in William Coxe's 'An Historical Tour of Monmouthshire' in 1801. St Julians was built by John Morgan's father-in-law Sir George Herbert. The sad destruction of the House in the 20th century, and the way in which it was done, is a dark chapter in Newport's recent past.